In an act of narrative boldness, Oniisama e… kicks off its last arc by focusing not on the struggle to get signatures for the petition to get rid of the Sorority, but on the effects that the petition is having on other people. It’s a bit of a risk, this shift in perspective, but it ultimately pays dividends by demonstrating exactly the problems the Sorority has caused on campus. Both episodes, but particularly “The Bad Apple,” focus on how the senior members of the Sorority are attempting to cope with the petition and with Miya-sama’s inaction. The panic of the senior members, especially Ladies Borgia and Mona Lisa, mirrors the challenge that occur when any upper class or elite is challenged by the lower classes. There’s scrambling, in-fighting, and maneuvering for a better spot after the “revolution.” It’s tough going, and not all the plans work out as well those on the top might help. Or, in this case, don’t work at all. 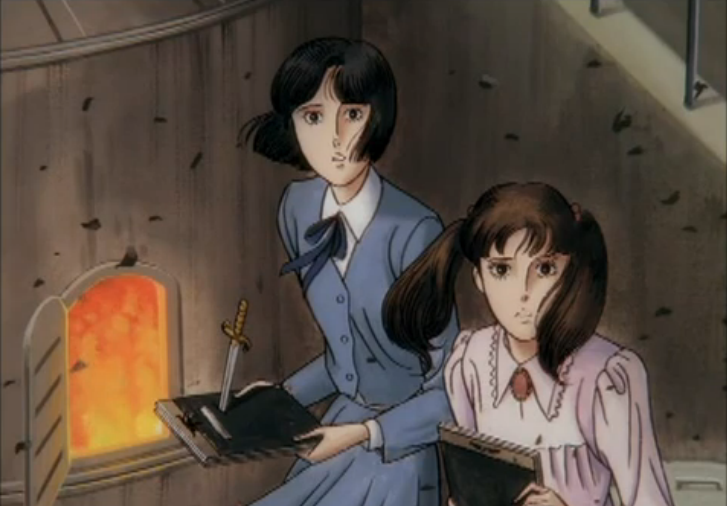 “The Petition” wraps up Misaki’s place in the narrative as Borgia and Mona Lisa convince Misaki’s two friends, Sonobe and Furuta, to pilfer and burn the petition books that Kaoru, Nanako, Tomoko, and Nakaya (the girl who was expelled from the Sorority for her low test scores) have been using. The two seniors dangle the opportunity of Misaki being admitted into the Sorority should they comply, and being faithful friends to Misaki, they carry out the plan. But it gets botched thanks to Rei’s daggers, and while a group of anti-Sorority girls are ready to demolish Sonobe and Furuta, Misaki says the plot as all her idea, so the blame, as it were, will fall on her. It’s actually a well-executed narrative for the show, and for Misaki. She’s been lurking around ever since Mariko’s attack, and given the fact that she takes the credit for the plot, it’s a clear sign that she’s attempting to punish herself for all the cruel things she’s done toward Nanako and Mariko over the course of the show. Even her jab about Nanako’s mom feels forced and half-assed, a line to be read to make sure the role she’s playing now is believable. But it’s not enough to ease her pain and suffering, and so she attempts to drown herself in the ocean. Misaki’s saved, of course, by Tomoko and Nanako, and she and Mariko have a small reconciliation, referencing a race they had in middle school, a race that had solidified their rivalry. They may have once wanted to beat one another fair and square, but the competition for the Sorority was too much, and it forced both into acts of cruelty, bullying, and ultimately intense violence. By the end, Misaki, Sonobe, and Furuta sign the petition, an official end to the havoc in their lives. With that plot foiled, Borgia and Mona Lisa take matters into their own hands, along with Lady Vampanella and Yamamoto (I’m sure she has an odd nickname, but I don’t remember it). This episode, even more so than “The Petition,” places the narrative emphasis on characters we don’t know all that well (or at all, really), but it demonstrates just how entrenched and important the Sorority is for its members. While Vampanella and Yamamoto aren’t exactly thrilled with Miya-sama’s leadership, neither are they willing to give up the status and luxuries afforded them as Sorority members, but they’re not exactly sure how to make a move against the petition organization. Borgia and Mona Lisa are convinced that Miya-sama’s inaction is somehow connected to the secret she shares with Nanako, and the four decide to find out what it is by any means necessary. But Borgia’s clearly in the mix only to elevate her own status should the Sorority survive, and more than anything else she’s interested in tearing down Miya-sama so that she can become the chairwoman. It’s like watching government and military officials attempt to a fill a power vacuum before the vacuum’s fully formed, complete with leading a rebel leader (in this case Nananko) to an abandoned warehouse for an interrogation. The whole warehouse fiasco, complete with the spotlight and crumbling balcony railing, is perhaps the episode’s biggest misstep, and may be one of the larger missteps for the series as a whole. It’s all a bit much, and that’s saying something for this show. But the near murder of Nanako is enough to rattle even the otherwise cool Mona Lisa to realize that they’re behaving horribly over a club. But it’s understandable. The Sorority represents not only luxury in the present but the opportunity for luxury and success in the future. It grants its members connections, training to be a rich housewife, and so on. It’s a lifestyle that needs to be protected, especially as, given the time the series was written (thinking 1975 here, not 1991–92), it was a major step in a positive direction for a post-school life for women. It’s not something to give up easily. We’re closing in on the home stretch of Oniisama e…, so I wanted to get the gears churning about what’s next. There’s four weeks of coverage left, which will close out my things in mid-December (if I’m doing the math right). After that, I plan to take two weeks off, and then starting on Jan. 1, 2013, I’ll devote a month’s worth of coverage to the original Astro Boy, in honor of the show’s 50th anniversary. I love this series so much. Thanks for reviewing it every week! I always look forward to it. I always thought “The Bad Apple” is really not a very good episode. It’s forced, and honestly, it was the first episode in an entire series I thought was not very good..